I think I am in the 3rd increase section, so I still have quite a ways to go. I’d like to finish it by the 9th of March, and if I can keep from surfing the free web directories and playing Facebook games, I may make it. Or maybe not. But I plan to try. The yarn is knitting up ok for 100% petroleum plastic non-fiber yarn. I’m pleasantly surprised. O, so, yes I finished it in time, see? This is the Pinwheel Sweater from elann.com. 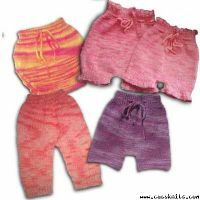 It is knit and crocheted from Brown Sheep Cotton Fine in color 230 Victorian Pink. I’d been wanting to knit this pattern for quite awhile, and if you recall, I started it last summer, and stopped a bit over halfway through the body, when I lost my knitting mojo. Now, I do have a couple of pattern notes to share. If you look at the photos in the link, you will notice that they never show you the front of the “sweater”. I’ve put sweater in quotes there, because it is not really a sweater. It’s actually more of a bolero, as you can see in this frontal shot. That worked out fine for me, since I really wanted to wear it to a formal event, and a sweater just would not have been quite the right thing. But I also wanted to warn you, in case a sweater is what you really need. Also, if you dance and spin, it will slip off your shoulder. But then it is really easy to let it slip off the other arm and throw it on a chair, so that worked out, too. The back worked up pretty much like the pattern showed. And a gratuitous shot, just so I can comment about how nicely the yarn washed up and smoothed out. The stitches evened out nicely, which was quite a feat, considering I knit the whole thing on 16 inch rounds. As I noted before, be careful on the lace. Mine is crocheted according to the written directions for the body lace. Those instructions do not match the chart. My lace is therefore a bit frillier than the lace on the pattern model, but that’s okay, because I am a frilly sort of gal. I figure that and good skin care products ought to keep me looking 18 forever, right? No picture for this entry, hahaha! On Friday the 19th, I still had an entire sleeve to go. An entire sleeve to knit and then 3 hours of lace to crochet. And I had to work. And then. Then, people, my kids’ bus was an hour late. And by the time it came, they had changed out of their uniforms and and so they missed it. And because the oldest one here is only 11, he’s not supposed to ride in the front seat. And so, I had to call in to work. I spent the day feverishly working on the sweater. And I do mean feverishly. My concentration was so intense that I didn’t even need to read appetite suppressant review to avoid over-eating. I just didn’t want to waste time on something so mundane! 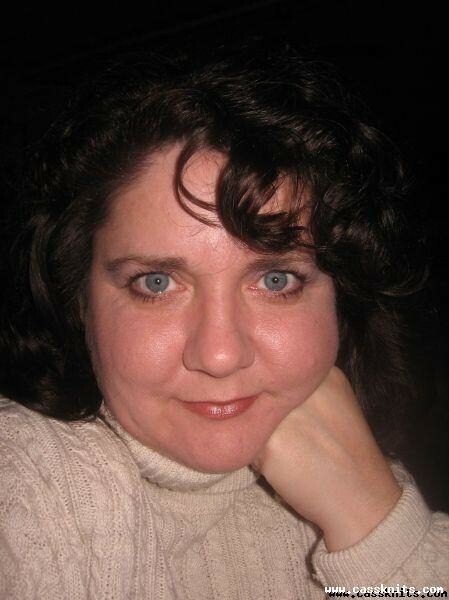 It was just me, the yarn and coffee, in the zone……. And just before I picked the kids up from their dad at 9pm on the night before the ball, with That One already here and trying to avoid the flames shooting from my fingers…..I wove in the last of the ends. Pictures in the next post! And here we have the sweater on the 17th. 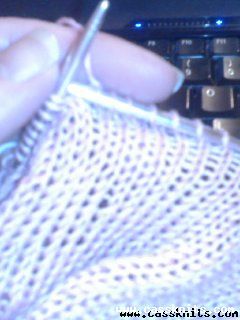 Still knitting the first sleeve. This was the point at which I seriously began to doubt my ability to finish the sweater in time for the ball. And also to wonder if I even had enough yarn to finish it at all. Instead of pregnancy vitamins, I take energy vitamins each morning, but a gal still has to have enough sleep to function, and at three days before the ball….yeah, I had quite a way still to go! On the 18th, I finished the sleeve lace and I discovered that the written portion of the lace pattern was incorrect. The chart is right, but I had only glanced at it for long enough to be sure I understood how the triple crochets fit together. As a result, I ended up with 1/3 again as many shells as I was supposed to have. I decided not to rip out what I had done, but to press on incorrectly. Ripping was just not an option given the limited amount of time I had. Is the suspense killing you yet? Ok, so. I haven’t posted in a while. But I don’t want to blow the whole wad in one post, so I am going to drag. it. out. for you, so you can re-live my suspense. You get one post per sweater picture. At least it won’t be itchy like eczema, just mildly annoying. Here is what the sweater looked like on Feb 10. 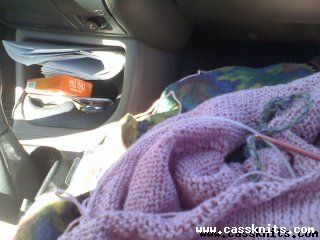 I snapped this shot with my cell phone as I was knitting on it and waiting for That One to finish up an appointment. I was still knitting on the body. Or maybe I had just started the lace border. Yes, that is it, because I dropped the hook as I was taking the picture! I also finished the project I said I wasn’t ready to talk much about last week. Since it is now completed and most likely in the hands of it’s recipient, I can share a few details now. I made it as a prayer shawl, and the pattern is from Sally Melville’s Book 2: The Purl Stitch. It was not a difficult knit, thought it did take a few repeats before the pattern became intuitive. After that, it was a pretty meditative exercise for me. And surprise! I saved a ball band, so I can tell you that it is made from three balls of James C. Brett Marble in colorway MT5. The next project I am racing to finish is the pinwheel sweater. I need it finished, washed and blocked by the 20th. I’m on the body border now, with two sleeves and their borders to go. Wish me luck!! There are no Kauai vacation rentals depending on it, but I do want to wear it that night if I can finish it. So, while some of you were busy at work, admiring your esthetically pleasing office furniture, I’ve been knitting, just like I said I was going to do. And I have finished a couple of things, just like I said I was going to do. This is DaBaby in her new hat. It’s made from some leftover purple stuff (ahem, sorry) and Berocco Lullaby in colorway 4304. Now, Lullaby is beautiful, and it is soft. It is also not good for knitting with dry hands because it is grabby, and it’s also real easy to spear it with your needles on accident. And I have 19 more balls of it to use up somehow. Hmmmm. In here are assorted unfinished projects, most of which don’t really require that much work. What am I saying, and who am I trying to kid? I actually have no idea what all is buried in that basket, but I do know it contains a just-needs-seamed BSJ and a just-needs-sleeves-and-turtleneck sweater for me. I guess we’ll just have to explore it together sometime soon, won’t we?